Many of the things taught in high school quickly become useless -- calculus rarely rears its head in everyday life, and who can remember how to put on a condom? Actually using his HS-honed skills for your benefit, the guy behind TBPhotographic. From a Chi-raised dude who took photography as a high school elective and ended up running with it as a career, TBPs beautifying your barren walls with creatively composed, surreally contrasted digital images of Chicago scenes both well-known and less celebrated, but not Wrigley, which is well-known for never getting to celebrate. 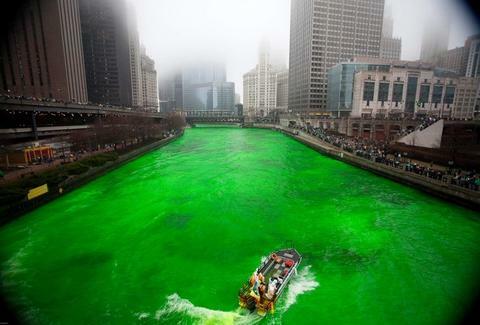 Iconic subjects include a nighttime capture of the Flamingo statue in Federal Plaza backdropped by the skyline, the Merchandise Mart glowing in the distance through a gap in one of the Chicago River bridges, and said river on a foggy March morning being dyed a brilliant shade of green, all to celebrate a lighter shade of pale. Slightly more abstract imagery comes in the form of a blurred CTA bus heading southbound on brightly lit Michigan Ave, the late afternoon sun illuminating a Michigan Ave. bridge, and an extended exposure of an evening Metra train's greenish glow streaking against the city lights, even though no one wanted to see its caboose. Recently he's also been tapping into his roots old school-style, foregoing technology for some film and darkroom work that's resulted in a gritty, distant black and white view of the city captured from a boat, and being so long out of high school one can only marvel at his control of seamen.